What role will the ‘Ulama’ – the Syrian oppositional scholars – play in a post-Assad Syria? Britain should send anti-tank missiles and other weapons to Syrian opposition fighters in a move that would encourage other Western countries to follow suit and give the Free Syrian Army the ability to defeat the regime’s forces, a dissident religious leader said yesterday said. Muhammad Al-Yaqoubi has become one of Syria’s leading opposition scholars (Ulama). Before the uprising Syrians respected Al-Yaqoubi due to his pedigree. He descends from a line of Damascene scholars originally hailing from Algeria. His father was a famous Sufi mystic whose face is still found on posters in the more religious quarters of Damascus. Al-Yaqoubi would probably have followed in his father’s footsteps had he not stood up on the pulpit of the Grand Umayyad mosque and denounced the regime. He fled his homeland and found himself addressing foreign dignitaries like the King of Morocco and think tanks like the Royal United Services Institute, whilst remaining in close contact with the brigades who regularly consult him on matters of jurisprudence. He is set to play an important role in post-Assad Syria given that Syrian civil society groups are still in their infancy and Syrians might resort to traditional personalities like him for guidance. On a recent visit to raise funds for a hospital I asked Al-Yaqoubi about his role in shaping his country’s political destiny. 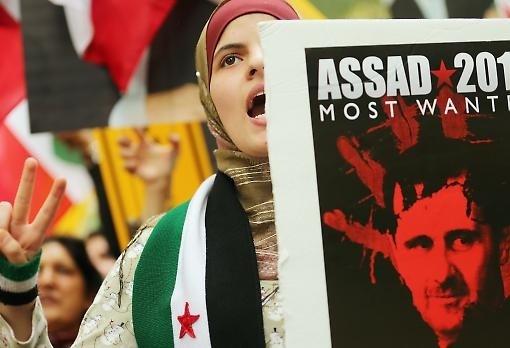 Why did you speak out against the Syrian Government? I spoke out against the regime in defense of the people. It is a religious obligation to support the weak and oppressed and speak up and not hide the truth. When something kills, it is our job to denounce the killing; it does not make it different when the murderer is the government – it actually becomes more incumbent on religious people, since often rulers in the Middle East try to use religion to justify their power. What did the government do to you after your speech at the Ummayyad mosque? I delivered two speeches on Friday, both can be found on Youtube. The following Friday after the first sermon – where I denounced the murder of around 300 Syrians, shabiha or secret service men came to the mosque with concealed guns before the prayer started. I assigned one of my students to speak and waited till May 5th when I delivered my last speech in which I denounced the regime and declared my support of the uprising and demanded full withdrawal of their military presence from neighbourhoods, the release of all prisoners and the removal of all military barricades. I described and denounced the way people were being killed at military checkpoints and held the government responsible for all casualties. I had already asked my wife to leave our family home and I immediately after the speech went into hiding. Our neighbors told us that the secret service came for me three times. I left Syria after a few weeks before a warrant for my arrest was issued. Soon after I left my name was on the government’s ‘wanted list’. How can the Syrian Ulama help in post-Assad Syria? The Syrian Ulama represents moderation. After the collapse of the Assad regime they will be needed to heal wounds and reconcile the various groups – especially the three million Baa’th party members who are not criminals. They will also have to confront the extremism of the hard-line salafists who just started their religious war against the rest of the Sunni population. Two months ago, Jabhatul Nusra demolished a shrine of a saint in Aleppo on the basis that it is un-Islamic; I issued a statement condemning it and called for wise people to come out and try to stop them. Now I am trying to form a political movement putting together Sunnis and Sufis to rescue the country and save our people from falling prey to either extremism or secularism. How can you and your likes alleviate sectarianism in Syria? The Syrian Ulama are not new to such work. It was always the Ulama who called for the protection of the minorities and defended their rights. Christians have nothing to fear from the Ulama. Can the likes of you moderate the Salafist brigades within the opposition? Salafists are of two types: moderate, with whom we can have dialogue; and extreme who do not recognize our authority. Is the future bright for Syria in the long run? Yes – It is certainly going to take time to make the change, heal the wounds and rebuild the country. What can the West do now? The West made several mistakes in handling the Syrian crisis. Early last year we warned and suggested that the FSA should be promoted and funds should come through it but nothing was done till several military groups grew strong outside the FSA and are now in control of half the country. Why are the Ulama important in Syria? Traditionally the Syrian Ulama are leaders. However, by having a few famous Syrian Ulama siding with the regime, the Syrian Ulama lost a lot of ground to the Salafists but still in terms of numbers, the followers of the Ulama are wider. Why should the West trust the Syrian Ulama and by extension you? Many of the Syrian Ulama’s works are transparent; they do not have a hidden agenda and will not consider violence as an option. However, if the West does not want to trust us, we ask for an exchange of interests. The West has its interest and we have our own – several of these interests converge and we do not mind exchanging interests. We do not consider the West as an enemy; we are not in a state of war with them and have several treaties with them.